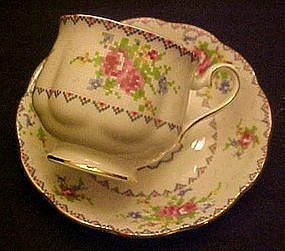 Pretty bone china teacup and matching saucer by Royal Albert England. Pretty petit point pattern of pink roses with fancy edge trim and gold accents. Both pieces are in perfect condition. I have 2 sets available. Price is for 1 cup with its saucer.